Welcome to Eclectic Twinn, the eclectic artist agency. We are always looking for talented new artists to add to our books, both vocal and instrumental, as well as DJs. We take bookings from promoters and private clients. Visit Shelley Twinn on MySpace! New! Book a DJ for that special event! Got the T-shirt? 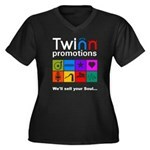 Unique Twinn Promotions merchandise now available! The layout and graphical content of this website is ©AlphaBeck.